Tiger Woods Won't Play In Ryder Cup, Will Rest Back Until December : The Two-Way The golfer says on his website that his trainer and doctors have urged him not to play or practice for the next several months. Tiger Woods rubs his back Aug. 8 during the second round of the 96th PGA Championship at Valhalla Golf Club in Louisville, Ky.
Tiger Woods, who missed The Masters for the first time in his nearly 20-year career this spring as he recovered from surgery for a pinched nerve in his back, will pass on this year's Ryder Cup as well, he announced Wednesday on his website. 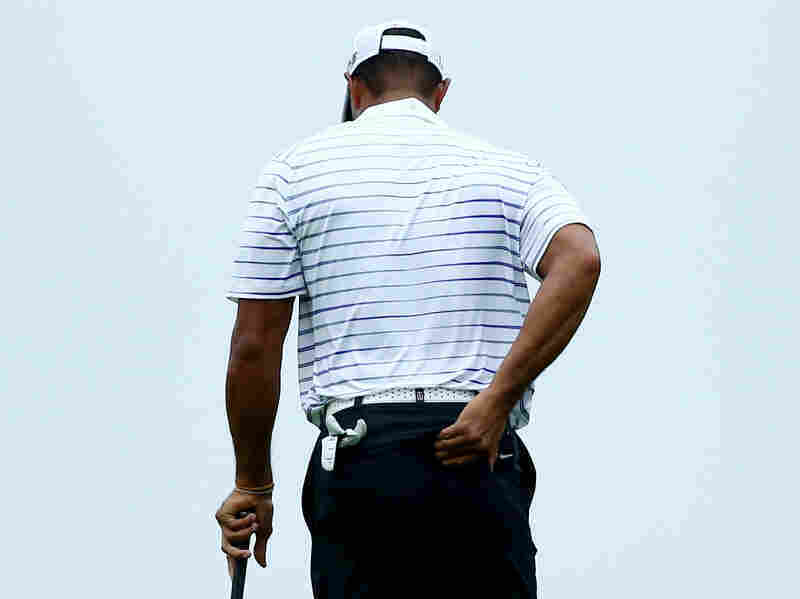 Woods also left the Honda Classic earlier this month with back spasms, and said in his statement that his doctors and trainer have encouraged him to sit out for several months. I've been told by my doctors and trainer that my back muscles need to be rehabilitated and healed. They've advised me not to play or practice now. I was fortunate that my recent back injury was not related to my surgery and was muscular only. I have already spoken to Tom [Watson] about the Ryder Cup, and while I greatly appreciate his thinking about me for a possible captain's pick, I took myself out of consideration. The U.S. team and the Ryder Cup mean too much to me not to be able to give it my best. I'll be cheering for the U.S. team. I think we have an outstanding squad going into the matches. I plan to return to competition at my World Challenge tournament at Isleworth in Orlando, Florida, Dec. 1-7. It's an event that's important to me and my foundation, and it will be exciting to be playing again.